I thought a few of our first posts would be to spotlight some of the previous parties we have done. 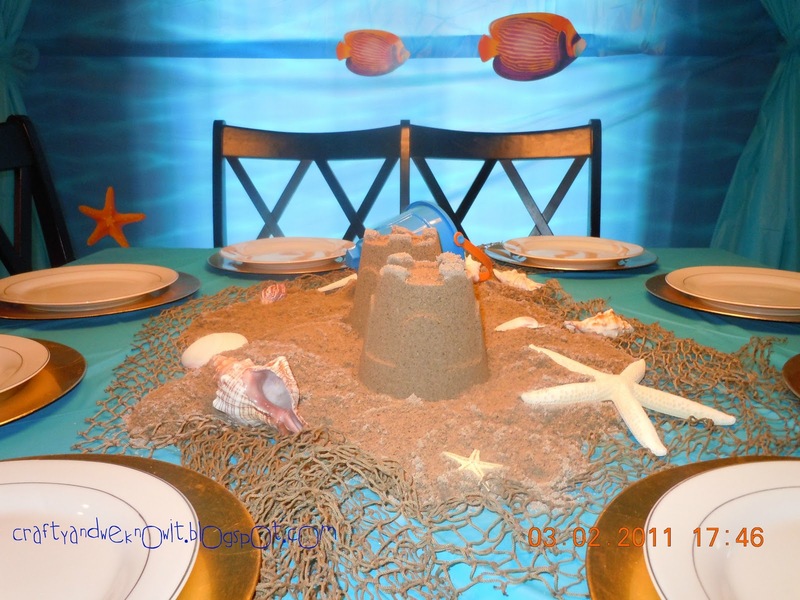 My amazingly divine friend (and co-blogger/creator) Dawn, helped her sister in lawn create an Under the sea adventure for some cute little girls! 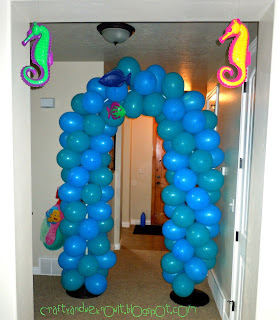 Upon entering the party, The girls arrived through the front door where they had to prepare to go through the handmade balloon arch. They were dazzled to see the sea horses and fish hanging from the ceiling and swimming above their heads as they walked through the arch! The table is set for the Mermaids with Gold chargers and real plates! These little swimmers get the best! A teal blue table cloth is placed down on the table with a fish net in the center extending to the tops of the Plates. On top of that is real sand, and sand castles! Of course there are shells and starfish that washed up around the castle...These little gals really felt like they were eating under the sea with this scene. Fish were swimming above them! Fantastic idea Dawn! 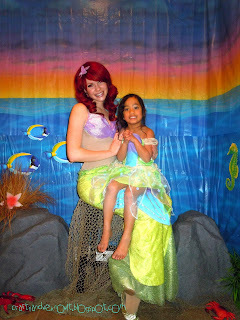 What would an Under the sea Little Mermaid Party be without Ariel there? A great backdrop was set with an oceanic scene setter on the wall with a stool for Ariel to sit on draped with a fish net. Faux rocks and "under the sea type" plants and fake crabs were placed on the ocean floor. These little mermaids were ecstatic to sit on Ariels lap for a photo op! 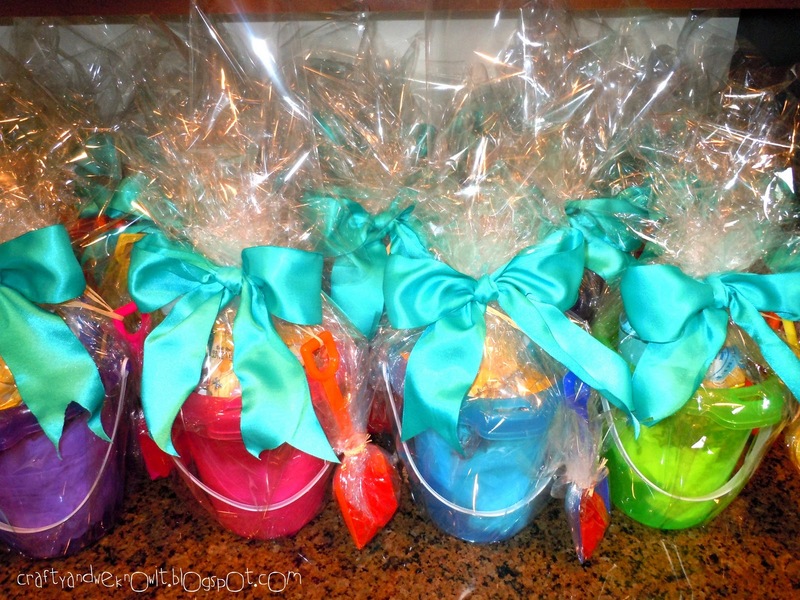 Party favors were made in Sand buckets with a shovel attached filled with all sorts of fun goodies and treats. You could put whatever your heart desires in them! Wrapped with cellophane and tied with a big teal blue bow! After all, you don't want your party guests breaking into the goodies until they get home! 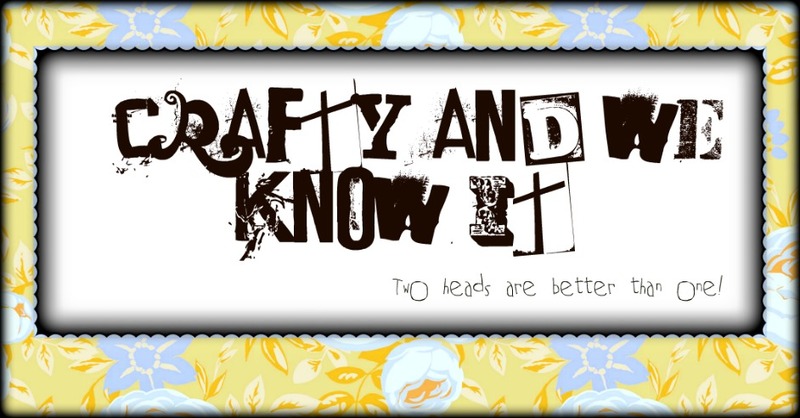 A great tie up to go with the party theme! Great Job Dawn and (Dawns Sis-in-law)!